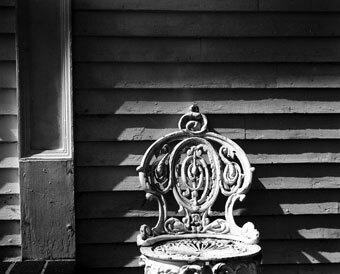 The wrought iron chair leaned against clapboards by the front door on only three legs, the fourth having fallen victim to some accident years ago. It overlooked the sunken garden, where generations of Aldrich cousins held stately tea parties for their dollies, under the spreading boughs of an ancient spruce. The open field nearby was filled with Queen Anne’s Lace and many varieties of wildflowers, which were gathered by the children into scraggly bouquets for their mothers and aunts.